Spyderco Sharpmaker vs. Lansky: Which one is the better sharpener kit for your knife? A frequently used knife will slowly become dull no matter what kind of material the blade employs. Even the highest quality steel can show signs of wear and tear after a certain amount of time. The edge sharpness becomes lower and lower which considerably reduce the knife effectiveness. Due to repeated uses, the edge ends up misaligned and jagged that make smooth, cleaned cutting become harder to perform. This is when a suitable knife sharpener kit can truly show its worth. A correct choice of the product could return the blade sharpness in no time. Spyderco is a respected and well-known brand when it comes to knifes and they also got great knife sharpeners. In fact, they have produced sharpener kits for several years before finally introducing their first knife. Nowadays, the Spyderco Sharpmaker is one of the most popular tools for knife sharpening. It’s light, compact and easy to use even for people with little knowledge about knifes. 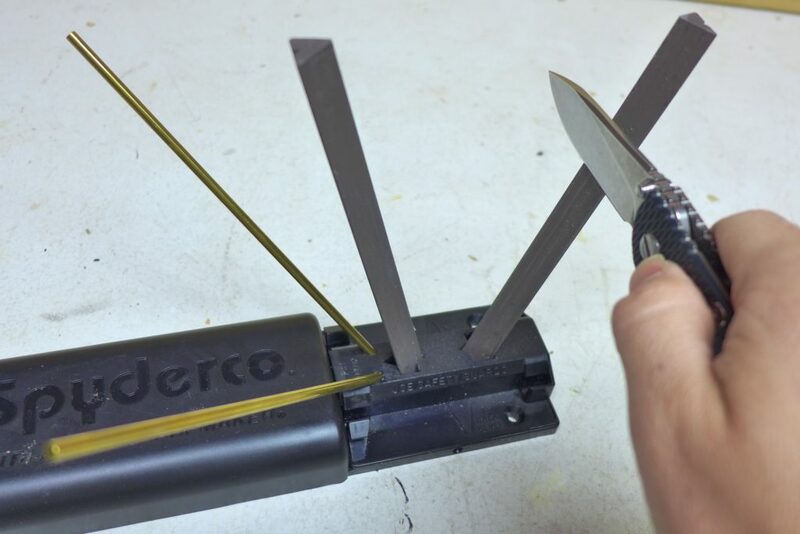 While the Sharpmaker is no longer a new product, its usefulness allows the sharpener to remain in circulation until today, far from its original birth. With a humble weight and limited dimensions, the Lansky is another great knife sharpener to have. Its simplicity and versatility mean the kit can handle a variety of knife blade at the appropriate angles. The inner storage spaces for the rods permit easy and secure carry wherever you go. You can conveniently fir the whole thing inside your pockets or drawers. 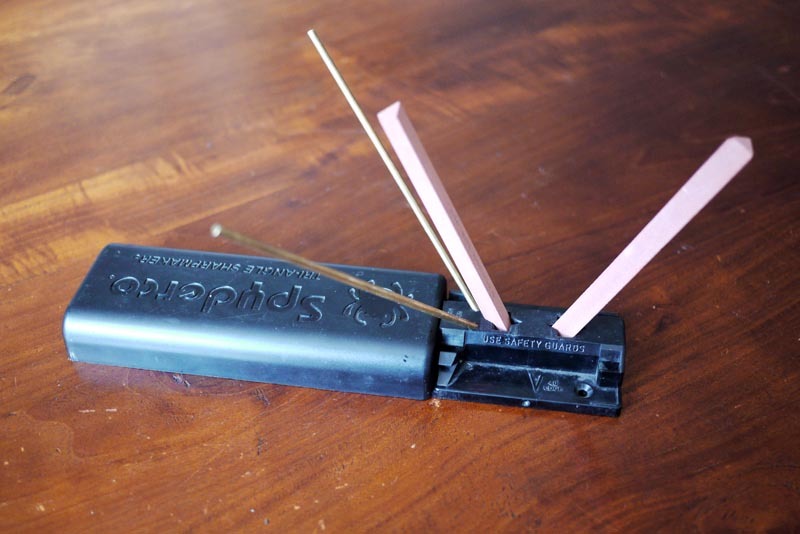 When a sharpening is needed, just take out the rods and deploy them on the case hoses. The case acts as the rods container and a stable surface for you to start grinding the knife blade. Spyderco Sharpmaker kit consists of several items to match a wide range of sharpening needs. It got four ceramic rods for sharpening (Two coarse and two fine), two brass rods and a two-part plastic case that also act the base of the rods. Everything is very durable and design with high efficiency in mind. When you have no need for it, the Sharpmaker components can be combined into a single unit. 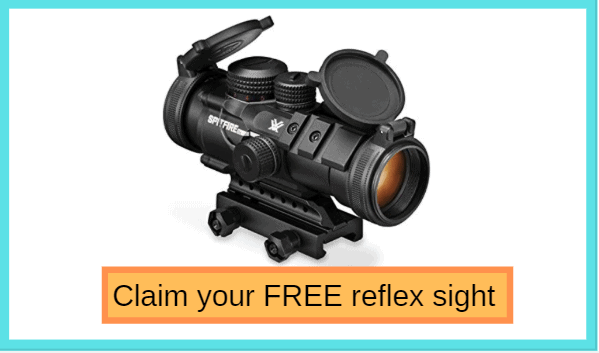 You can quickly and effortlessly tuck that away and take it out again when a need arises. It’s small so the requirement for space is not really a big deal. 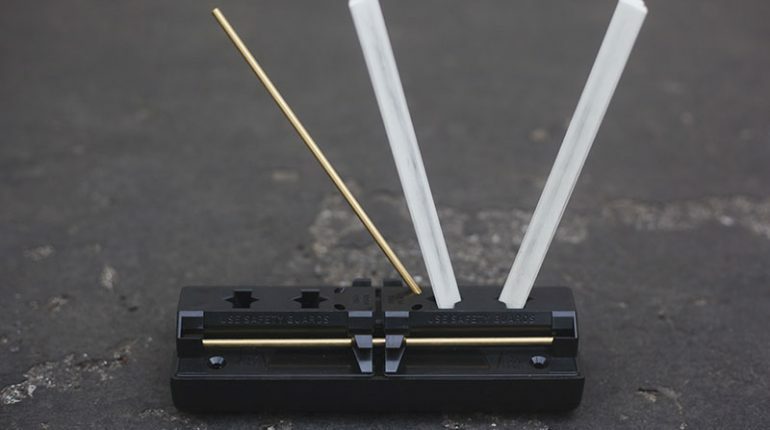 Using a turn box construction, the Lansky sharpener kit case contains the rods within itself. The case end and the rest are held together with a screw which allows you to turn the cap. This will reveal the hidden rods inside the internal compartments. There are four rods in total: Two brown ceramic rods (Medium Grit) and two white ones (Fine Grit). Right on the case surface is the sets of holes for you to stick in the rods. The entire thing is a simple yet effective design with a slim profile. It’s even smaller than the Sharpmaker so the Lansky is a portable sharpener kit. In order to use the Sharpmaker, all you need is a stable and level surface then you can start deploying it. When you unpack the case, you will a number of holes for you to insert the rods. There are two angle settings you can use in here, the 40 degrees and the 30 degrees. The former is best used for the average sharpening while the latter is when you want to stiffen the edge a bit. When you decide on the angle to use, put the rod into the hole and grind the knife blade up and down the rod. Continue till you can achieve the wanted result on the edge. When you need to use the Lansky, also select a suitable surface to work on so you don’t slip your hand by mistake. Turn open the end cap and take out the rods from the internal compartments. As mention before, there are holes on the case surface with different angles for the rods insertion. Pick the angle you want, set in the rods and start grinding the edge. Run the knife edge through the rod and repeat the process. Begin with about 10 – 15 passes for each of the edge sides on the brown rod and move on to the white rods. Both the Sharpmaker and the Lansky use ceramic rods as a component in the kit. Once in a while, you will need to cleanse them so as to remove metal particle accumulation from all the grindings. Ajax or similar cleaning solutions will work wonderfully here. Of course, you can rotate the rod side in each use to increase the time between cleanings. And do remember that ceramic is a good material but not really the strongest. Handle them with care since if you accidentally drop them onto the floor, they may shatter. As a sharpener, the Sharpmaker and the Lansky are high-quality products that function very well at their intended purpose. But if you got large size knifes and require dedicated sharpening, the Sharpmaker will be the better choice. It’s a good kit that can handle virtually all of your sharpening needs. From enthusiast to amateur, the Sharpmarker can answer to any demands. However, it’s much more expensive than the Lansky. So if you are on a budget and only need the average sharpening, the Lansky will surely not disappoint you. And that should be all of the main points, not too hard to understand, right? Any knife owner must have something to keep their knife sharpness and that is why a sharpener kit is important. With a detailed comparison between Spyderco Sharpmaker vs. Lansky, you may have a general idea of what is a good product to buy. But if you see that one of the two products above fit all of your preferences, don’t wait anymore and just get them. How Much Does a Katana Weigh? How far does a shotgun shoot?